Oh Man! Never in my dreams, would I have thought that The Beginning of Everything would have been the Beginning of a book lover affair for me! I adored every moment of this book! It had such beautiful qualities; Fantastic characters, a storyline that both broke your heart and melted it at the same time, and a great romantic touch. Ezra was such a great character! I loved his dry humour and his warmhearted side. There was nothing hiding underneath the surface with Ezra. What you see is what you get. Cassidy was such an awesome character, too. I loved her free spirit. I also loved the mystery behind her. *Avoiding spoilers*. There are moments where I was just dying to learn her story. I love how Robyn Schneider penned Cassidy and delivered her story. There were moments that my heart literally ached for her. Not only did Schneider craft two fantastic main characters, she paired them with a wonderful group of secondary characters. I simply loved Toby. He often stole the spotlight with his spunky and hilarious personality. This book is perfectly character driven. A story about 2 different people that fall into sync with each other. A story about self discovery and growth. It was a pleasure to see these characters blossom and learn who they truly are. Like true high school life, it comes with it's speed bumps and dark clouds; So not all is sunshine and rainbows with this story. Prepare to have that heart of yours skip a beat, melt and break all throughout this book's 335 pages. 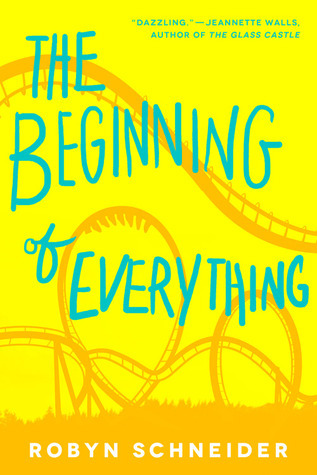 Close off your summer reading with a bang and read The Beginning of Everything. Was a great way to wrap up a great summer of reading! I enjoyed this book a lot too-the writing just clicked for me and propelled me through a great read!